Sabah is looking at a proposal from a company in China to develop agro-tourism in the state. Deputy Chief Minister Datuk Christina Liew said a China-based company was keen to invest and develop agro-tourism here. Agro-tourism, she said, was rapidly gaining popularity as it offered tourists a variety of agriculture-related activities. Also known as farm tourism, it involves activities such as visits to animal or vegetable farms to feed livestock, harvest vegetables or pick fruits. "This is where tourists can gain first-hand experience of agricultural life," said Liew after meeting with a five-member delegation from Silk Road International Property Development Group. Also the state's Tourism, Culture and Environment Minister, Liew said agro-tourism could be added to Sabah's list of tourism products such as eco-tourism, adventure tourism, cultural tourism, medical tourism, golf tourism, historical tourism and heritage tourism. The potential investors from Silk Road International were led by the group's chairman Zhu Yin Hua, who was accompanied by Sabah-based Datuk Dr Wilson Yong the vice chairman of the group. "By capitalising on what Sabah's agriculture sector has to offer, we can develop agro-tourism as an additional tourist attraction here. 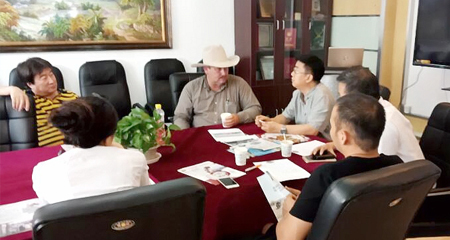 "We can take tourists to farm areas for educational and recreational purposes," said Zhu.